Love and Learning was founded 15 years ago to help special needs children develop language and reading skills. 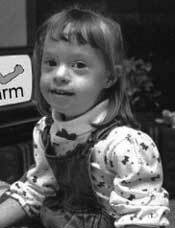 Our earlier experience of working with our own daughter, Maria, who was born with Down syndrome, convinced us that reading was an attainable goal for her and one which could bring her much enjoyment as well as serve as a vehicle for learning. As our work with her continued, it became apparent that reading dramatically impacted on her language development as well, and our work with other children showed us that the gains Maria made were possible for them also. 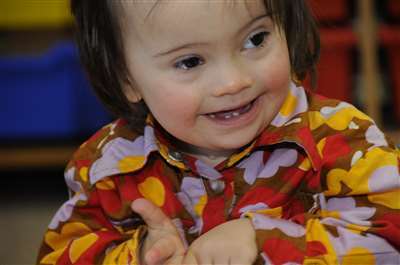 In fact, the more Maria taught us about the potential of children with Down syndrome and the more we learned about the related work in reading/language being done in other places, the more convinced we were that a major breakthrough was taking place which would require a re-evaluation of the potential of these wonderful children. We made our first books, audio tapes and video tapes for Maria soon after her birth when we were unable to find anything commercially available that was appropriate for her special learning needs. We based the origin and development of our materials and technique on the understanding of three basic concepts. The first is that a child's language development starts soon after birth. Research done by psychologists at the University of Washington in Seattle indicate that infants as young as six months are able to discriminate between variations of specific vowel sounds and will respond to those sounds most typically used by the adults with whom they interact. This study indicates that rather than being a passive receiver, an infant is in fact organizing and categorizing these small units of language called vowels into meaningful categories. This finding is consistent with the current interest and research into the importance of a child's first three years as it relates to brain development. The importance of this early period in an infant's life is now being recognized for all children, not just those with special needs. But if these are crucial and important years for typically developing children, they are particularly so for a child with learning difficulties. So it is important that we maximize the advantage nature gives us in these early years to impact on our children's later development by providing stimulation and learning opportunities for them. This is, of course, the thrust behind early intervention. The second concept upon which Love and Learning is based is that teaching reading to a child with Down syndrome actually enhances language development. Our experience with Maria when she was very young was that the words she learned to read were those she most readily incorporated into her spoken vocabulary. Equally amazing to us was the rate at which she learned to read. At 3½ years she could read and comprehend 250 words and we found her articulation measurably improving. By 5½ years, she could read and comprehend over 1,000 words and was evaluated to read at the 98 percentile of all children of her age. The fact that articulation and vocabulary increase with reading ability was something we heard from many parents whose children use our materials. Children with Down syndrome are typically visual learners and since reading is language made visual, it is the ideal means of helping with expressive language, normally a deficit area for them. The ability to read also is a powerful and dramatic way to reverse the stereotypes many people, some professionals included, hold about our children. In addition, the ability to read and the praise it elicits from others enhances a child's self-esteem. And of course, reading opens up an entire new world of learning and enjoyment that we want all children to experience. The third concept basic to the Love and Learning technique is the thoughtful use of new technology coupled with parental involvement. Technology here refers to video tapes, audio tapes, computer programs and especially television, all of which can be powerful teaching tools. 6 months: We began showing Maria lower case alphabet flash cards, one time through the alphabet each day, spending 1-2 minutes. The alphabet was used not to teach reading concepts, but rather to give Maria examples of simple sounds that she might try to imitate. 12 months: We began using an alphabet/word audio tape at nap and bed time. This was not intended to be sleep learning and Maria was awake most of the time the tape was playing. She would usually not fall asleep until all the letters of the alphabet and associated words were said. We made a video tape for her using these letters and words and added flashcards with these same words as well. At about 1 year of age Maria developed myoclonic seizures and required medication. The medication stopped the seizures but had the side effect of dulling her sensitivity/response to sensory input. Her lack of response to audio stimulation was initially diagnosed as a moderate-to-severe hearing loss. Further testing indicated that her lack of response was due instead to the seizure medication. We continued using the audio tape, video tape and flash cards. 2.5 Years: Maria was taken off of the medication and the seizures did not return. At about this time she started talking back to the audio tape as it played. She also started to name some of the letters when she saw them on the flash cards. Over the next year she started to recognize words. 3.5 Years: Maria had a reading vocabulary of about 250 words. 5 Years: Maria had a reading vocabulary of over 1000 words. In addition she could read and translate 100 words in French and Spanish. Evaluation by the school psychologist to determine education placement showed her to be reading in the 98 percentile. 8 Years: Testing related to Maria's Individualized Educational Plan found that she was reading at a fourth grade level with a comprehension level at second grade. 9-16 Years: Reading continues to be Maria's area of strength. She especially enjoys reading the dictionary and encyclopaedia. Her word recognition has always been at or above her age level. Comprehension of stories and subject matter has not been as high. Television in particular, through the use of specifically designed educational video tapes, can have life-changing benefits for a child with special needs. We can use it to present stimulating, fun material that fosters learning even as it entertains. When special videos are given guidance and reinforcement by a parent and/or teacher, their possibilities are extraordinary. We have successfully used videos to teach language (English), reading, geography, maths and even foreign languages. And because we can play these videos over and over, the child gets the repetition he or she needs to master the skill or concept without the parent having to do it all. If, after repeated viewing, our children can memorize the dialogue to their favourite movie, shouldn't we give them a chance to learn something far more useful? By using television and video technology thoughtfully, we can present a wide, exciting array of topics in a manner which greatly facilitates learning. Our first learning kit teaches the names of the letters but, more importantly for language development, we work on the sound that each letter makes as we stimulate vocalization. Parents whose children use our materials have observed that knowing how letters sound enables their children to reproduce the sounds that make up the word. Often a child who is leaving off the last consonant has been able to correct his pronunciation by going back and looking at the letters which comprise the word. Kits #2-7 continue working on improving pronunciation, vocabulary, comprehension and reading skills as we model simple sentences, teach conversational skills and more expressive vocabulary. Each learning kit includes progressively more material, all of which is presented in a simple, direct format which allows the child to focus on what is being taught. The key to the process is consistent use of the materials. The time required of the parent each day is quite short but spending that small amount of time five days a week over weeks and months is what enhances learning and builds up long-term memory. "Literacy - the ability to read - opens many doors. Until quite recently, it was thought that only an exceptional child with Down syndrome would be able to learn to read; that most children and adults with Down syndrome could not learn to read. Pat Oelwein at the University of Washington, Sue Buckley at The Sarah Duffen Centre in Portsmouth, England and Joe and Sue Kotlinski, parents from Dearborn, Michigan, were able to look beyond those negative predictions and make an effort to teach children with Down syndrome to read. Their efforts were so successful they necessitated an entire re-examination of the potential of children with Down syndrome to read." We are finding that one of the 'many doors' opened by reading is language development. We believe that the work being done today in this area will contribute to a greater understanding and appreciation of our children's abilities and potential.